-Help us provide information to the public- we need to put time into networking with other local agencies and experts, getting resources, and presenting those resources and informtation to the public to help with the wildlife recovery effort. -Help us build and distribute as many T-perches and bird boxes as possible in 2018. T-perches are tall t-shaped perches that many of our local raptor species (both diurnal and nocturnal) can utilize for the "perch and search" style of hunting. Barn Owl, Western Screech Owl and American Kestrel boxes will also provide roosting and nesting sights as so many of them have lost their cavity homes. -Help us buy specialized ICU caging for our hospital that will provide much needed oxygen treatments for birds and other wildlife affected by prolonged smoke exposure. They are also incredibly useful for many other infirmities. *Update- we have just been quoted on this system and it will cost us $17-18,000 dollars with a yearly cost of $1-2000. -Emergency generators for ORC, we need two, and a handful of other emergency supplies that we did not have when the fire came. ***UPDATE 5/18/18*** We have had LT Generators generously donate a generator that can power our main building! -Another vehicle for ORC. We are thinking we need another van in order to safely evacuate everything we need in the event of an emergency. Our sprinter van loaded with all our education birds cannot hold- emergency perching, emergency/mobile hospital supplies and we also need a separate vehicle that would evacuate our hospital patients. 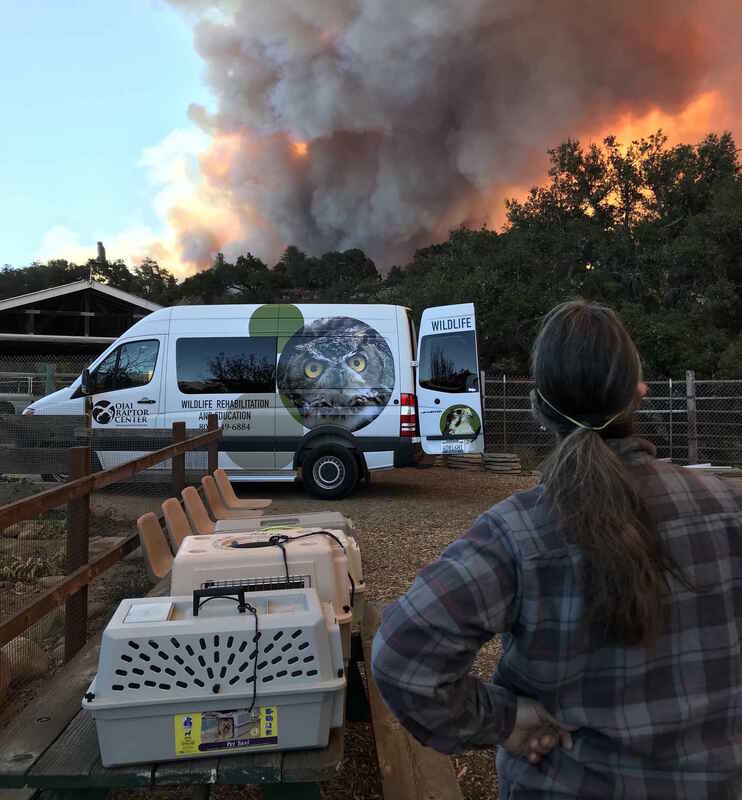 ORC did not sustain direct damage (besides a thick coat of ash) in the fires and this fund will be ongoing to help valley wildlife. We have had an outpouring of support and tons of questions on how people can help so we wanted to have a way for people to support us and know where donations are going. If you aren't able to donate, the best thing you can do is share our Thomas Fire Wildlife Recovery Information Page. Donations are so needed for individuals and businesses that have been directly impacted, so many have lost everything, ojairelief.com is a great starting point as well as the donation pages on Greater Goods Ojai, and thomasfirerecoverynetwork.com. This donation is in honor of Gregory Azbell - my favorite human and the coolest avian enthusiast I know! Thank you for all the incredible work that you're doing to help and care for wildlife affected by the wildfires! Thank you for all you are doing to help the displaced wildlife after the Thomas fire. Thanks for all the good work you do to save and protect animals! I want to help ORC with the post-fire nesting bird season and it's efforts to establish owl boxes throughout the area!